4:30 AM: I think that was about as perfect a resolution as they could get. Maybe not a perfect story–I’m not far away enough from the emotion of the story to analyze it–but as far as taking these people to an end after five years, this all felt exactly right. I’m going to have to come back much later to take this apart because the one thing I know they nailed is the emotional involvement: I was sick to my stomach all the way through from the tension and I’m still weepy, way too involved to be critical. I care about these people, I needed them to be, well, not safe, that’s not an option, but stable and living in a world without Samaritan, doing work that fulfills them. And I got that in the end. It was still gut-wrenching. “Everyone dies alone . . . but if even a single person remembers you, then maybe you never really die at all.” When Reese smiled and said, “Sometimes one life is the right life,” I lost it. And then the Machine stayed with him, so he wasn’t alone at the end after all, even as she stayed with him at his father’s funeral, fracturing time to understand him. God, I’m gonna miss this show. Still not sure how I feel about the time shifts. Back at you later on that. • Finch vs. Samaritan, the real obligatory scene with the real antagonist. • Reese sacrificing himself for Finch. It was always in the cards, but it’s still heartbreaking. It wasn’t just an earned death, it was a volunteered death, a sacrifice for love. • People got to say good-bye, even Root to Shaw in the end. • Showing Root as the Machine. We needed to see her again. • They even pulled out a happy ending. Well, bittersweet ending, with everybody who survived where they’re meant to be. Even Bear. • And the Machine saved herself in the end. I think that’s a good thing. • Good for Fusco for putting the Samaritan guy in the trunk. Good for Shaw for putting bullets into Jeff for killing Root and knifing Fusco. Good for Fusco for surviving. 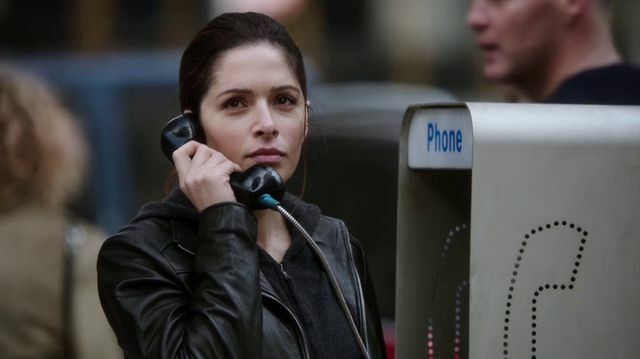 • Shaw answering the phone and smiling. This was a damn good finale for an outstanding show. I’m so glad you posted this because for some reason my pvr didn’t record it and I was able to find it on another channel next week. It really was an interesting move: to minimize the amount of action so they could give all of their focus to the love letter to the characters. In other ways, it was a direct answer to the last episode, showing just how much our main cast’s lives were enriched by The Machine, and then just the worthiness of The Machine herself to exist. Samaritan itself was barely a footnote in this episode, just a tool used to facilitate all of the characters making choices that illuminate the core and arc of their characters. Very ambivalent on whether or not Harold should have survived. It’s justified in either direction. Ultimately, though, it feels right that Grace, as the only unambiguously good character besides Bear, be given everything she wants. It’s a beautiful love letter to the characters all right, but this show has done better before by using meticulous structuring, exemplified in TDS. There’s some structural weirdness in this ep. The memory of Grace is the only one of its kind, it’s not bookended by TM interstitials, but we do see TM “searching archive footage” interstitials later to remind us that the first half of the ep is flipping between actual present and near-present, but we only see that interstitial once. I’ll have to check and see if that was all before Amy showed up in person, which would excuse the lack of them for when she was remembering the cops, or watching child-John. The flipping back and forth itself is…I can see what they were trying to do, which is to show just how much TM is unbound to traditional time, but the framing devices used were too inconsistent. The insertion of the Grace memory seemed to be just for any potential person who somehow manages to watch the series finale as their first PoI episode, so that they know who Grace is, and why she wouldn’t freak out on seeing Harold again. Either they needed to include more Grace memories in this episode in a structural pattern (not a good choice), or seed Grace memories more consistently through the season. Not sure if I appreciate all of the repetition in this episode. TM says that opening schuckbait monologue at least 4 times, and the “I watched people die to understand them” speech twice. There was probably a better way to execute what they wanted with those repeats. I thought the Machine monologue wasn’t repeated by the Machine, I thought the Machine had left the recorder on to play that message over and over again, a Thornhill low-tech way to give herself back her memories when she rebooted. I’ve only watched this once so I’m hazy on the details, but that recorder was very old school and the extension cord that was powering it was heavy duty. I thought it was just playing over and over and over until the Machine could find it again, in which case, the repetition was important because nobody is talking to anybody, it’s just an aural hard drive, part of the Machine’s plan. I’d also argue that Samaritan was crucial here; those waves of killers were all sent by Samaritan, every time Our Gang was blocked it was because of Samaritan. It even tried appealing to Harold directly in Times Squares on the big screen. It saved itself, retreated to a satellite, sent the missile to NYC, killed Reese, shot Finch, stabbed Fusco . . . I thought it was a great antagonist, always focused on Finch but taking care of the others, too. I really need to see this again–but not yet–but I think the structure here might be key. The big drawback of Samaritan as the antagonist is that its only avatar is that little boy who’s just annoying. 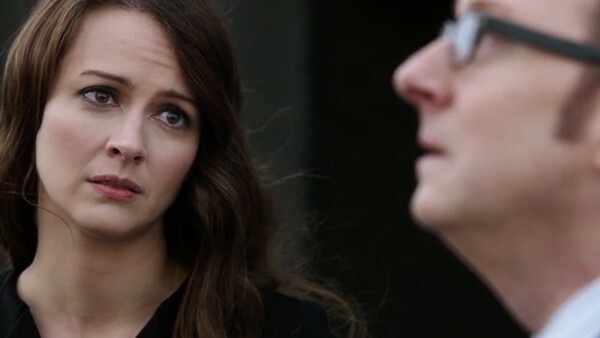 It was important to see Root-the-Machine there at the end, but Samaritan never really had a partner in the way that Root and the Machine were partners, probably because it never understood humans the way the Machine understood them. But again, this is going to take rewatching. Later. The writing wonk thing I’m left with after one watching is that this was riveting and ultimately satisfying. I agree that Harold’s ending with Grace was almost too much HEA, but still deserved. And Reese got an HEA, too, when the Machine lied to Finch so that Reese could die saving him. And Fusco’s a top cop again, and Shaw has Bear and Root’s voice in her ear. That’s pretty damn good. I’ll rewatch with that in mind. Possibly some rearrangements of visuals might make that more clear, or I just missed that framing entirely first time through. Sure, Samaritan is key, but as a plot device. A stakes generator. But in .exe, it was its own character, with its own personality. Not so much here. Even the Times Square scene was more about Harold’s final confrontation of choice, than to further characterize Samaritan. For this series finale, I thought that was a good approach. TM’s talks and memories about various people dying weren’t from malicious murders. The focus was on how the dead lived. Samaritan is truly dead because no one will remember it. It had no loved ones, because it was truly inhuman, unlike TM. Put together with .exe, I definitely feel like this was a strong and deserved ending to the show. I agree. I wish the network had aired the two back-to-back. I wish that, too. This was an emotionally satisfying ending on many levels, and it worked for me. I think my problems with .exe came from suspension of disbelief — something I’d been struggling with all season long, but that finally came to a head in that episode. For an artificial intelligence — for any intelligence! — Samaritan was really quite stupid. I hit my breaking point with accepting it in .exe. If this one had played immediately after it… well, actually, it might have ruined this one for me, too, if I’d spent the whole show fuming. In some sense, my expectations still weren’t met — I thought that the Machine team would win because of their humanity somehow, because people are not entirely predictable and because even after 12,000 simulations, Samaritan still didn’t know how to break Shaw. It just wasn’t as good at understanding people as it claimed to be (and, I expect, as a real AI would have been.) I hoped that Samaritan would be relying on a tool (operative) that had second thoughts and didn’t do as he was told, and I anticipated the guy that Shaw kills at the end as being that guy. But the final scene was exactly what I wanted it to be, anyway, even if it didn’t play out the way I wanted it to. I thought Blackwell would turn, too. He seemed to be such a decent guy. Then he killed Root. Stabbing Fusco was just icing on the cake that Shaw was going to kill him with. I think Samaritan’s programming is what killed it; it was hobbled because it wasn’t instructed to learn people the way the Machine was. It would have known that Reese’s father died a hero, but it wouldn’t have spent the time trying to understand what that meant. I need to watch this again with a more focused eye, but the Machine said something about watching people die over and over again, trying to understand, whereas I think Samaritan would just have seen death as a Return 0, the program had run and it was over. I think they did win because of their humanity. They won because Reese loved Finch and sacrificed himself to save him, because Shaw loved Root and defended the Machine that had become Root in her mind, because Fusco evolved into a good man and a great cop who could still kill the bad guy and put him in the trunk (loved that callback to the pilot). In a way, they won because the Machine took Root’s voice and made it all personal. But I also loved it that the Machine killed Samaritan by giving the final copy bad code. I thought it was a very tight finale. The Grace flashback doesn’t have Machine-view interstitials because it’s what Harold’s dreaming or seeing while he’s passed out. It’s his mind’s eye, not the Machine’s. Yeah, I got that it was a memory, but for there to only be one flashback of this kind in the entire episode felt shoehorned. Compare to Terra Incognita, where that was used to foreshadow how the entire episode was about faulty memory. I liked it, because the second time I watched the episode I think I understood why it’s there. It’s not so much about Grace, but about Harold’s father learning about birds in order to be a good parent. And the parallel with the machine teaching itself about humanity and despair so that it could be what Harold wanted it to be; we think of Harold as the machine’s father, but it also became a caretaker of him and the world. I thought this was a pretty great finale, even though I didn’t want it to end. So glad we got to see Root again. I agree. I think also that it was important that Harold be happy since Reese and Root both deliberately chose to die to save him. It’s that “Earn this” bit, although Reese would never say that because his death was the way he paid Finch back for saving his life and giving him five years of good to make up for the bad past, and Root would never say that because she died so he’d be there to save the world. I think their sacrifices would have been less if he’d buried himself in the subway again, even if Bear was there. But to go on and get the life he gave up to save Grace and the world, that’s necessary, I think. I still haven’t watched this again. I want to, but I still need coping time. Such a great, great long form story. The structural weirdness of the episode makes perfect sense to me when you come at it from the angle that every episode of this show, with the exception of the Ghost Carter episode in S4, ha been from the perspective of the Machine and (starting in s4) Samaritan. That’s what I was leaning toward, too, although mostly I was so caught in the story that I didn’t think it through. The thing is, if replicating the Machine’s confusion in its dying moments makes the story confusing, then it’s not a good move. And I was confused a couple of times, but never so much that I couldn’t follow the story or was pulled out of it. So I think it works. Since the finale I have come here to post several time and the words have just been lost. So really just wanted to say thanks for doing the commentary on the series and this last season. It is funny at how relieved/happy I was that the Machine made it, and without having to merge with with Samaritan! I hated that John died, but felt like it really fit with the story, and that he got to go out a hero like his dad and saving Harold, who gave him 5 more years. I also liked that everyone had someone to move on with, Harold with Grace, Fusco with his son, Shah with Bear, and going back a bit Carter’s son Tyler? was with his father, and while the Machine still has the entire world, still also has a direct link with Shah. I pre-ordered S5 dvd that comes out 7/19… but I may not re-watch the season until I feel I need a good cry! Geez… and now I need something new to look forward to! I know. The more I think about it, the more I think it was perfect. I’ll do a wrap-up post and then start thinking about the next binge. I’m thinking Limitless or iZombie just because no more darkness for awhile. They both go dark, but not like PoI. I just need to find out if they’re streaming somewhere. iZombie doesn’t come back until 2017, I think, so probably later for that. And I need to get back to Leverage and finish that, too. That always makes people happy. But that PoI finale was wonderful. The only flaw in this show is not enough Leon. They said they couldn’t get Leon and Zoe back because they were working other shows. That glorious smile on Reeses’ face when he was preparing to die…. This has been nagging at me. Where was Bear during the subway escape? Did someone take him home at some point? Fusco recovering so fast from multiple gut stabs. I am eagerly awaiting my DVDs so I can re-watch with pause and rewind and no commercials. Every time they go back to the subway and Bear comes running, I think, “Who’s feeding and walking him?” And then they moved the subway car . . . I think it was probably due to the short season. There were a lot of things they didn’t really finish, like Zoe and Leon. I keep thinking about Zoe finding out that Reese died. She’ll roll with it, but she’ll still miss him, especially since we got rid of the therapist. I love that Stanton talk. And I felt the same way, just so terrified for a bunch of fictional characters. I think I’m most impressed by what they did with Reese’s death. By having him choose to die for Finch, they made it a good thing instead of a tragedy. Just so impressive. I think that if Finch were killed, even though that was Finch’s choice, Reese would never get over it. After a lifetime of losing people: his father; his girlfriend/fiancée and most of all, Carter (rip my guts out, why don’t you show?) losing Finch might be the thing that sent him tumbling over the edge and Reese knew it. Reese loved all those people but Finch is the one that gave him purpose and gave him his life back. Still, up until the last mili-second, I didn’t want to believe that Reese wasn’t going to prevail and shoot all those Samaritan dudes in the knee. I’m going to give a day or two and watch the episode again. I feel like I couldn’t absorb it all because I was just so tense. I still haven’t watched it again, and I want to. Just not yet. Any thoughts on what happened to Finch? Does he bleed out trying to get help? End up in jail? Go to Europe looking for Grace? Hide in a cabin in the mountains? Start an NGO providing low cost tech to 3rd World children? Get a job as a bank teller? It was the scene at the end: He goes to Italy and finds Grace. So I celebrated my 4th of July by re-watching the last four episodes of POI. They are all excellent examples of storytelling, even the weakest one, POI goes to Washington. The last episode still had my stomach in knots although I knew what was happening. Both times I watched, the episode seemed much longer than an hour just from the sheer tension. I noticed a couple of tiny things that might be called continuity glitches and they leave me with some inconsequential questions but wow! This show went out with a bang and I’m not talking about the missile. I’m glad your posts inspired me to go back and start watching POI again. I stopped after the first season due to time constraints even though I enjoyed it , so I power watched all 4 seasons in order to be ready for season 5. Now I’m going to start watching Leverage, another show that I stopped watching after the first season. Oh, Leverage! You’re going to have SUCH a good time! I finally saw the last two episodes. And cried. I don’t think there was another ending possible for John. He knew it and so did the Machine, and that smile…I just finished watching so I’m still kind of raw. After not being able to save so many people he loved, I think being able to go out saving the person that saved him finally gave him some peace. I was so happy when the phone rang, and Shaw looked eager to get back to work. When they introduced Blackwell I thought he would turn on Samaritan. But honestly, there’s no coming back after killing Root. I’m glad Shaw shot him. I’m glad Fucso killed that agent too. “I left him in the trunk. Guess I haven’t changed that much.” Go Fusco. I was satisfied with Harold going back to Grace too. It was time for him to be happy. I’m so glad other people were that affected, too. I finished the show and just sat there, stunned, crying. It was so good but I haven’t been able to go back and watch it again because of the impact. I just thought I was a wuss, but since I have company on here . . .
That show is just great storytelling. To make us care that much at the end, to make Reese’s death a positive thing, to give us that much catharsis and satisfaction . . . just brilliant. You know, I think one of the reasons that Reese’s smile as he died had such impact is that he almost never smiled. He smiled at Zoe a lot, and in the later seasons he’d smile at Fusco when he was teasing him, but that one was just pure joy, that he’d saved his friend, not mention the world. Still, rip your heart out . . I just finished watching the last episode, and sobbed. But the thing was, I wasn’t just crying over the characters – I was crying over the whole thesis of this grim show – that love matters most and death can be triumphant and a machine can learn to love. Thank you for introducing me to this show. c) The evil side has nuance and gray areas. Had things been different, some of Our Guys could have ended up with Samaritin. And Samaritin did a lot of good. And Our Guys did a lot of bad over the course of the show. And then there were moments when we thought Samaritin agents might turn. It’s nuanced, and reasoned, and yet that never diminishes our guys’ heroism or victory. d) AND THEN THEY GET A HAPPY ENDING. They live, or they die in a way that changes the world for the better. They get to say goodbye. It ends as a nuanced triumph over fear, as a vote of confidence in humanity, despite knowing full well what humans are capable of. In arcing the characters, they arced the entire thesis of the whole show. And I’m still trying to wrap my mind around it. So, yeah. Thanks for the recommendation. I cried to because it all ended exactly right. Well, it would have been great if Root had lived, but she’s the one who said she’d live on in the Machine. And really, considering it’s Root and Shaw, she practically was the Machine and Shaw wasn’t a really touchie-feelie person anyway. She’ll have Root talking in her head forever. And Bear. She looked happy at the end. Not alone and with a sense of purpose. And John was really jubilant in death. That was a harrowing final season though. Brutal but brilliant.